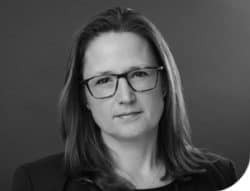 Katie is an experienced family financial barrister used to dealing with complex divorce financial cases involving tax, trusts and international issues, pre-nuptial agreements, and legal arguments. She predominantly is instructed to appear in the High Court and Central Family Court in London. She also deals with Schedule 1 Children Act financial applications. Katie sits as a Family Recorder on the SE Circuit, and has been a qualified Family Financial Arbitrator since 2017.